International Women’s Day Moet Marquee - Celebrate International Women's Day in the Moet Marquee on Newmarket Race Day. Be inspired as successful women from the racing industry share their stories of achievement and enjoy Moet and Chandon Imperial as part of the all-inclusive ticket price. Proceeds from this event will be donated to Got Your Back Sista, plus there will be Westfield Kotara gift cards to win! 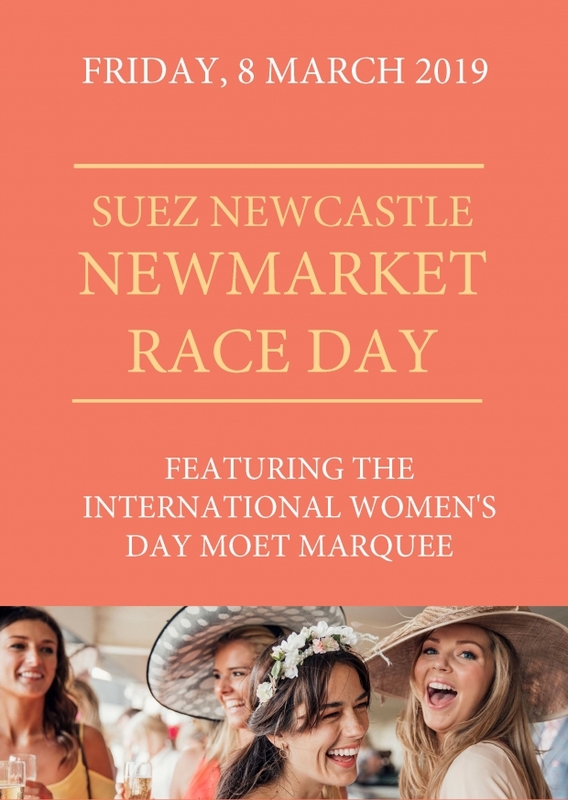 Be part of Newcastle's premiere event to celebrate women at one of the most exciting race days of the year. Chevals Restaurant - With panoramic views of the racecourse, full bar and tote facilities, Chevals Restaurant is the ideal venue to experience an exceptional race day experience. Delight your discriminating palate with chef prepared cuisines from the fresh harvest of Australia’s bountiful farmlands and the rich surrounding oceans. Members Lounge - The Members Lounge offers Members and their guests perfect views of the Winning Post and Parade Ring. Chairmans Suite - Exclusivity and personalised service enrich the delivery of hospitality in the Chairmans Suite. With unrivalled view of the racetrack, Winning Post and big screen, the Chairmans Suite features a tantalising menu and beverage selection. Mark Murphy Lounge - Located above the Ascot Bar the Mark Murphy Lounge provides spectacular views of the entire racetrack and surrounding areas. The Lounge has a bar, bookmaker and tote facilities. Have your reserved table catered for you and your guests by ordering from our platter menu, which will be delivered right to your table. General Entry - Enjoy the thrill and excitement of thoroughbred racing at Newcastle Racecourse. Dress to impress for a fun day at the race with family and friends. Our Racecourse features bars and catering outlets open all day and with a variety of options there’s something to suit everyone. For a more relaxed day at the races, bring along a picnic to enjoy on the lawn. For Chevals Restaurant, Members Lounge, Mark Murphy Lounge and Chairmans Suite Bookings please contact our Events Team on 4961 1573. For all other booking please select your tickets above.